Sometimes I just need to get out of bed and into the world of the living. My bed is comfy for the morning, but by afternoon I am ready to face the day. Enter book stores. I LOVE bookstores! They are so peaceful and ALL of your best book friends surround you. Luckily LA has NO lack of awesome book shops! Here are a list of the top five that I have found and fell in love with! 1. The Last Book Store - Downtown LA. This was my first LA bookshop. One of my best friends was coming to visit and I was looking for interesting places to take her. She is a huge book nerd like me so when The Last Book Store popped up I knew it would be perfect. Inside is gorgeous and spacious and upstairs they have the most gorgeous arch made out of books! They even have records and live music. The only downside is that parking can be a bit of an issue downtown. BUT it is definitely worth the hassle to get lost in this amazing space. 2. Book Soup - Hollywood. I stubbled upon Book Soup while heading to The Viper Room. This lil corner of LA is actually quite perfect. I have my lot I park in pretty cheaply, a Coffee Bean, The Viper Room and Book Soup all in a one block radius. Book Soup is cute, quirky and always has some type of event going. Authors are always there reading from their books and doing signings. There are stacks HIGH of books and adorable gifts. Book Soup is a small but mighty find. 3. Magic Door IV - Pomona. Another one I stumbled on while heading to a show! The Glass House concert venue is on super adorable street in Pomona. There are a bunch of lil places and one was this tiny book shop! I might have squeed and ran across the street when I spied it. I stayed in the shop for about an hour looking through all their books. There were so many old ones. It was amazing just to hold a book from 1901! The owners were super sweet and had no problem letting me take the time to nerd out over their little slice of heaven. 4. Iliad Bookshop - North Hollywood. GUYS! There is a sign on the door to this book shop that says be careful not to let the cats out! Cats LIVE in this book shop!!! This is not a drill! I searched high and low for the kitties but could not find them. Apparently they can be shy sometimes. BUT that just gives me a reason to go back because besides the cats this shop is amazing! Ceiling high bookshelves. A vault of rare books and I even found some really neat old ones just sitting on the shelves! My favorite was a Shakespeare for Children book. It was really old and falling apart, but pure magic. The stories were still in tack, just made shorter for children. PLUS the shop is only a few blocks down from my favorite place Republic of Pie...so I will defiantly be making that a weekly stop. 5. Vroman's Bookstore - Pasadena. Before I talk about this amazing book shop, I have to say that when I parked my car down the street, I unknowingly parked directly in front of a record shop! I about lost my mind. I walked in with the biggest smile and it didn't leave my face until I left with a Record Store Day release that I had been searching for! NOW the bookstore. Vroman's is a labyrinth of amazing-ness! EVERY corner of this shop has something adorable. I easily did some birthday shopping for friends. The shop is huge and has an upstairs full of YA books where I could spend a day. Downstairs is an adorable lil coffee shop where I of course had to relax and enjoy drinking coffee surrounded by books! This one is pretty close to home so I cannot wait to make it a regular hangout! 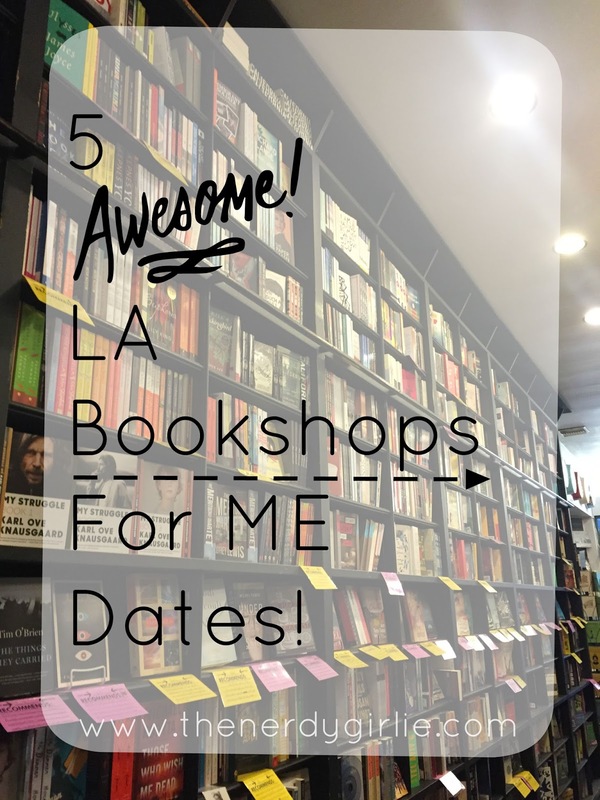 What I loved most about my book shop tour of LA was discovering new places on my own. Having some me dates and taking my time and enjoying things that I love so much. I don't think until the idea for this article came that I was doing much me time. I'm thankful for the inspiration these places have given me and the time to just BE in a moment alone and be ok with that. Do you have any places you like to go and be alone with people?! I am really enjoying the experience of striking up a conversation with people I come across in daily life. I think we all need to do more of that. Interact with our fellow humans. It is so nice to be in the "real" world after loosing myself in blogging. I wish we had awesome bookstores here. I haven't found any yet... just big box book stores. Also, I don't know if I've said this, but I love your HP tattoo. This post is amazing and has added so many places I need to check out for myself! I think the Republic of Pie + bookstore pairing is amazing! Will have to make it an excursion one of these days. Awesome post! I love bookstores not only as a place to purchase, but to just hang out! Unfortunately, indie bookstores are very few and far between in San Diego, so you are a lucky nerd indeed to have 5 fantastic ones within reach. Oh my gosh, I LOVE the one with the giant books outside! & the one with cats..omg!